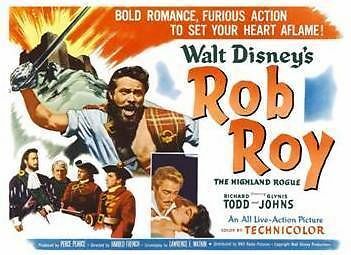 Walt Disney came to England in 1949 and made Treasure Island at Denham Film Studios followed by The Story of Robin Hood 1952 again at Denham and starring Richard Todd in the title role with Joan Rice. These two were very good films indeed – in fact I would go so far as to say that Robin Hood was a great film - and they were quickly quickly followed by The Sword and the Rose and then Rob Roy The Highland Rogue and these too also starred Richard Todd who made three major films for Disney – all in England - I reckon he was in these three films within the space of just under two years. In fact Treasure Island (1950) grossed $4 million, returning to the studio a profit of between $2.2 and $2.4 million and The Story of Robin Hood did even better. 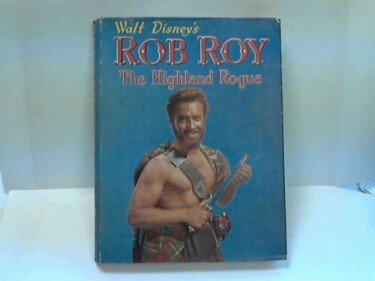 However Rob Roy The Highland Rogue missed the mark at the Box Office and didn’t fare anywhere near as well, and in fact probably because of this, Walt Disney took his next Live Action films to Hollywood and did not return to England for a few years. Here – above – is an interesting item – a book of the film which would have been sold at the time. This film was chosen for the Royal Film Premiere of the year in 1953 but it seems that later papers released in 2010 shows that The Queen was not happy with the choice. 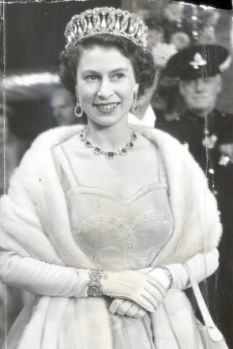 For nearly 50 years the Queen has graced the red carpet at Royal Film Performances. But newly discovered documents show that in the early years of her reign she found the movies so dreadful she complained to then Prime Minister Sir Winston Churchill during an audience at Buckingham Palace. She may have once even considered boycotting the event. The 1954 Royal Performance of the film Beau Brummell – starring Stewart Granger and Elizabeth Taylor – was a particular cause of displeasure. The Queen and her officials were also unimpressed by three previous films – Where No Vultures Fly, Because You’re Mine and Rob Roy The Highland Rogue.